The start of Fallout: New Vegas is a good surprise, so stop reading if you don't want even a hint. Not that the first scene of Fallout: New Vegas makes sense (or hasn't been alluded to before). The confusion it elicits is intentional. The game begins, as I recently experienced first hand, in first-person perspective, the camera pulling back from the Las Vegas stip out into the Mojave desert, where our hero's hands are tied. We are facing three men, one of them in a checkerboard jacket. They are armed. Our courier mission has gone bad and these men mean us harm. We are shot. When the playable portion of Fallout: New Vegas begins, we wake up in a house. (We've told you about this part before.) We are being tended to by a helpful man, Doc Mitchell, though the player will rightly feel confused about what is going on. There is no Vault to start this new Fallout, no lengthy locked-room training zone in which we might play portions of our hero's youth as we learn the game and the stakes. In New Vegas we are confined briefly, just enough for the helpful man to double-check what we look like and to ask us a few questions to better understand us. That's all character-customization of course. We are picking and confirming our character's attributes of body and mind in this, the newest of the malleable Fallout role-playing games. Before leaving the house we may also choose our first Trait, an extra character-defining quality not offered in 2008's Fallout 3. Some of these have pros and cons. For example, "Four Eyes" would give us plus-one to our perception if we wear glasses, minus-one if we don't. An odder one, Weird Wild Wasteland, would turn a lot of the game's cheekier jokes on or off. For example, you can play New Vegas with a willingness to come across a refrigerator that contains a bullwhip and hat — or you can play without worrying about seeing them. The jokes are an homage to Fallout 2, which was also full of pop-culture references to the delight of some fans and the consternation of others. I had about a half-hour to play New Vegas, which is an eye-blink of time for a Fallout game. I had the opportunity to be trained in the gameplay or to wander. The training is optional. An early quest can bring us to a lady who will teach us how to shoot, using the returning probability-based VATS targeting system of Fallout 3, which pauses combat and lets the player select body parts to target. She also instructs us how to use the game's added iron-sights weapon view. Most of this will feel familiar to players of Fallout 3. New Vegas runs on what seems to be the same technology and functions of Bethesda's in-house-developed Fallout 3. The game systems are mostly the the same. You still wear a Pip-Boy on your arm with displays for your inventory, map and stats, just like in Fallout 3. I bailed out of training early and walked the desert. We were far from the Vegas strip. I walked down a highway, past a ruined rollercoaster and up a hill topped with towering statues representing an attempt at peace by two of the game's factions. The Mojave desert doesn't have the familiar landmarks of Fallout 3's Washington, D.C., so statues like that help define the terrain. I was frequently accosted by gangs who shot at me; and I found near the statues some guards at whom I shot. While messing with combat, I learned about a couple of tweaks to the Fallout 3 system. Targeted body parts can sometimes be armored, which is represented by a shield icon. This makes some enemies harder to kill, of course. The item-repair system has changed. Now, from the start, players can combine like weapons and repair them to 100% functionality. If you raise your repair skills in this game you are raising your ability to make better forms of ammo and to slow the degradation of your guns. There are also now potions and poisons that you can make, just as there were weapons to forge in the last game. Weapons are made at workbenches located in the game world; potions and poisions are brewed at campfires. At the recommendation of the attending developer, I made a turn and walked to a place called Nipton. Here, I was told, I would see how warped the world of New Vegas could be. Weird is right. I found a town taken over by people in wolfskins. Some of the town's citizens were hanging, crucified for uncertain crimes. This wolf gang was too tough for me to fight, but to vile for me to want to leave unscathed. I did not reach Las Vegas. I did not find out what my courier mission was supposed to be. I did not find the men who shot me. I had barely gotten started. I liked the small tweaks I saw in the gameplay, but, in this my first hands-on with New Vegas, I was struck by how similar the game runs to Fallout 3. New Vegas is a game that doesn't feel like new tech. It feels like new content, a return to the earlier Western U.S. focus of the original Fallouts. It's hard to predict where this Fallout: New Vegas desert adventure will lead the player, but I like that it starts with a mystery and is open to the discoveries of a wanderer. 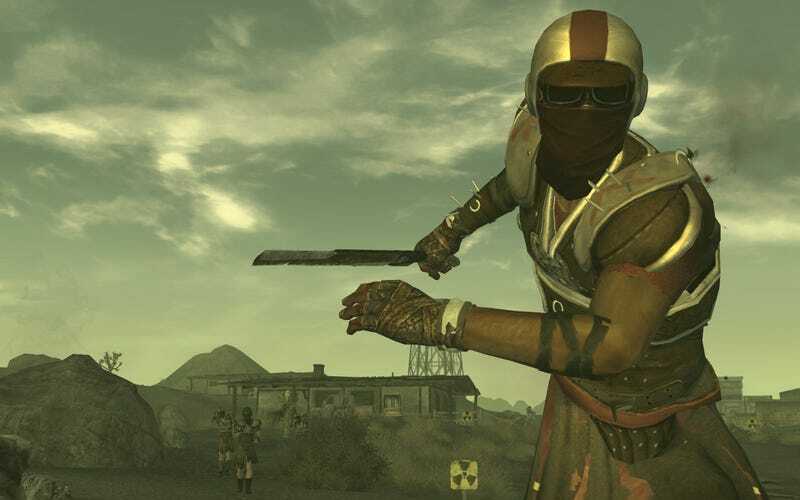 Fallout: New Vegas will be out for PC, Xbox 360 and PlayStation 3 in October.